Wouldn’t it be nice if the students who walked through our doors came prepared with all the content knowledge from previous years they were supposed to have? If this were the case, teaching would be a lot easier. At times our job as teachers can feel extremely overwhelming, if not impossible. How in the world can we possibly be expected to teach 25 to 35 students at different levels and abilities? I asked this same question to myself over and over again during my first years as a teacher. 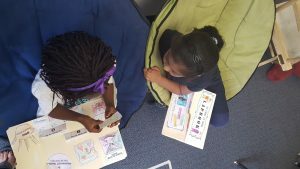 I had implemented a variety of differentiation strategies just like they taught me in my undergraduate program like leveled readers, centers, and literature circles. However, I still didn’t feel like it was doing enough. I then started doing research and discovered the world of learning menus and choice boards. 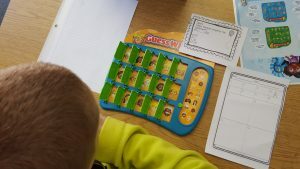 Choice boards are an amazing graphic organizer that enables students to choose how they will learn or show their understanding of a concept or topic. 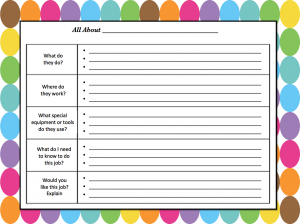 Here is a list of 10 reasons why choice board are a great tool for any classroom. Choice boards are by the far the most effective and easy ways to differentiate that I have found. 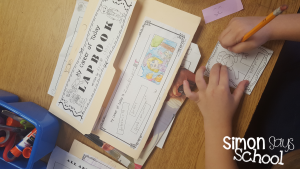 There are so many wonderful resources available to help teachers plan meaningful activities to learn and showcase their learning like HERE. What other resource can you use to differentiate across all content areas? 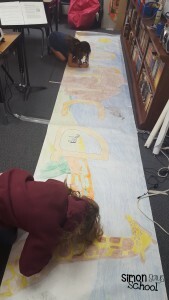 I have integrated these boards for units on space exploration, the Oregon Trail, measurement, and even as an alternative to standard reading logs. 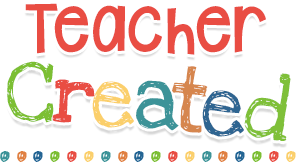 No matter what you are teaching, you can create a choice board to match. 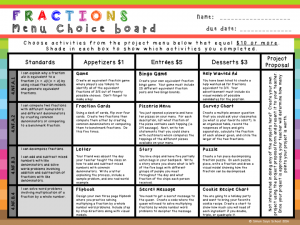 Choice boards are an amazing tool that empowers students through choice. 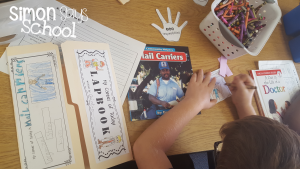 Students are able to take ownership of their own learning because they had the opportunity and freedom to choose which activities to showcase their understanding of the content or topic being covered. I always put in a “Your Choice” option for students. This way if they have the freedom and flexibility to create their own activity if none of the options appeal to them. 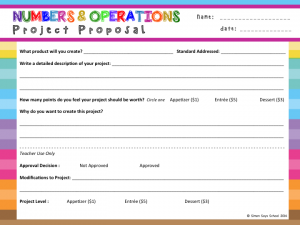 Before students can begin on the activity they created, they must complete a project proposal graphic organizer to help them plan out their activity. Students then must present their proposal to me for approval. This way I can help them polish their idea or get them on the right track if they are completely off base. According to Morzano, one of the most effective ways to engage students is to give them choice. Students will find more meaning and will be more focused if they are given the flexibility and freedom to choose how they learn. 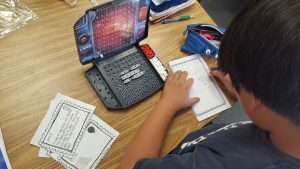 Depending on the amount of time that is available, choice boards can be used for a single lesson, a whole unit, or even as a homework assignment. 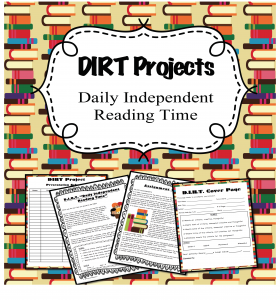 I loved using choice board as apart of my Weekly 5 reading centers (my way of adapting The Daily 5). There were choice boards for the writing, vocabulary, and word work centers. For each center, student had one day to complete one of the activities on the menu. 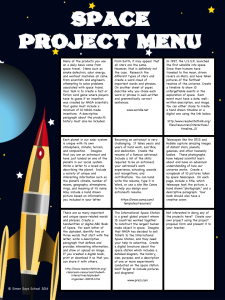 Other menus I have created, students have had an entire month to complete it like my Independent Choice Board Project I created to replace reading logs. 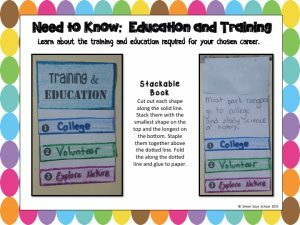 Teachers can choose from many different choice board formats like learning menus, tic tac toe, 2-5-8, baseball, and many more. Click HERE to find dozens of examples. 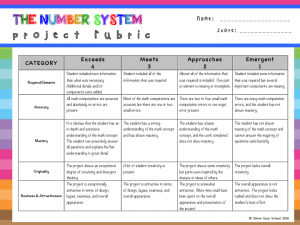 These menus can be evaluated using scoring rubrics that can be applied to every project imaginable. 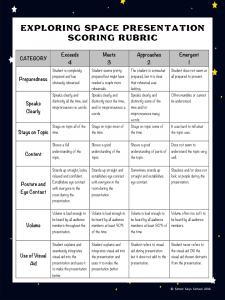 I created my own activity and presentation rubrics for the and pretty much use them for everything. 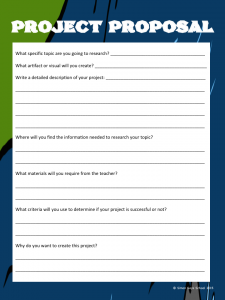 You can also give students more ownership by asking them to create the rubric together as a class. There is no doubt that integrating choice board project into my classroom has been a huge game changer. All students, especially gifted and reluctant learners, have benefited because they have developed a greater sense of ownership, the ability to work at their own pace, and the freedom to choose or design activities based on their own interests and readiness. 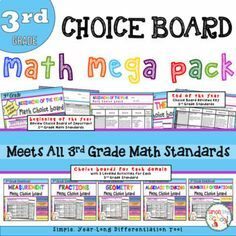 Now that I am the gifted and talented resource teacher at my school, I collect choice boards across all grade levels and subject areas. This way if teachers come to me for help, I can pull out a surefire way to meet the needs of all the students in their classrooms that is both effective and easy to implement. 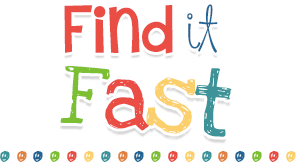 During my first year of teaching, I was told by my grade level chair that the best way to prepare for a standardized test was to give A LOT of sample tests. I thought something seemed fishy (because it went against everything I learned in college) but since it was my first year teaching, I didn’t want to ruffle any features. I decided to go along for the ride and see what happened. I remember staying hours after work one Friday in the copy room working along side my fellow teachers making 30 page packets per subject area (math, reading, and language/writing) for our students. It was grueling and didn’t leave feel me feeling excited for the next week. This should have been a pretty clear sign that I needed to do something different because if I am not excited then there is no way my students will be either. That next Monday, we began! My poor kiddos took the first practice test without much complaint because that is how test prep had always been. While reviewing the test together, I decided that I wasn’t going to do this again. I was so bored and knew that my students felt the same way too. Now don’t get me wrong; I definitely believe that practice tests can be helpful in teaching test taking strategies and defining expectations for students. However, there is no way that three weeks of packets is a good idea. 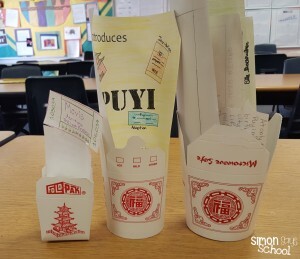 Of course, I didn’t want to waste the packets I had created so I used them as the questions for the games and activities I created. 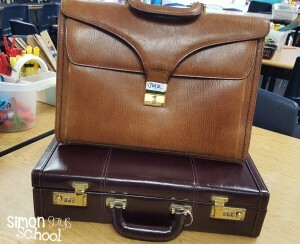 I walked into school the next day armed with an arsenal of fun and creative games and activities. The response I got from my kiddos was amazing. Not only did they enjoy reviewing, they also scored higher than any other class at my school. I truly believe this is because the review we did was purposeful, engaging, and fun! 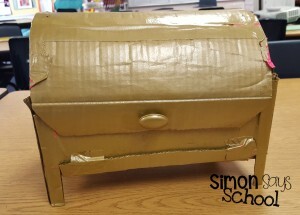 Since this time, I have added new ideas to my suitcase of testing activities and hope they are just as helpful for you as they were for me! 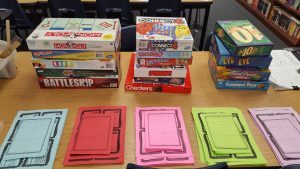 Introducing easy to play board games is a great way to make test review fun and engaging. Before a student can make a move, he/she has to correct answer a question (task cards are the best). I always have both students answer each question that way they both get the practice and can help each other if needed. A separate answer page that shows all work to complete each problem. A minimum of 10 word problems. The test must have a minimum of 35 questions. After students finished, they took each other’s tests and then met with the test writer if they found any errors. I loved how my kiddos were able to help correct any misconceptions that either the writer or tester had. 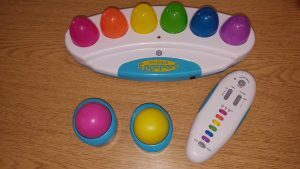 I love my Eggspert! After dividing students into groups of four and giving each a marker board, marker, and eraser, teams have to work together to correctly answer the problem posed. Before a team can push their egg (bells works great too), all members of their team must have the answer and support work on their board. I then will randomly call on one student to explain how they got the answer. This forces groups to really explaining their thinking to one another and help those who might need extra help! If the group gets the correct answer then they earn 10 points, but if they get the wrong answer then all the other groups can steal for 5 points. Of course you can play Jeopardy, Deal or No Deal, or any other game you want! Create a chain where each link is a different question. 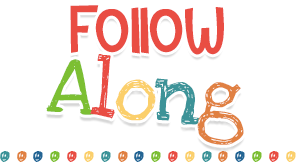 Ask students each morning or at the beginning of the new class period to pull a link and everyone answers it as board work. This is a creative way to create a countdown to the big test! Don’t know what to do with your son’s or daughter’s Easter eggs? Save them and use them for test review. 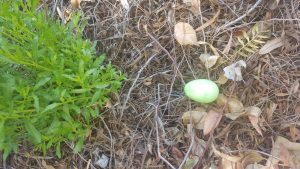 I place one question in each egg and then hide the eggs outside for students to find. This is always a big hint. 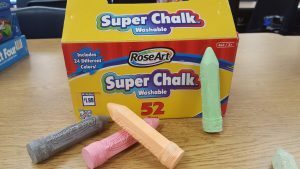 Everything is better when you get to use sidewalk chalk. 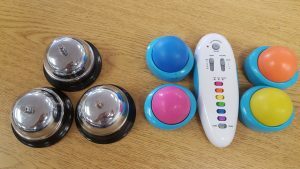 These are just a few ideas I have used in the past to make test prep fun, engaging, and more meaningful to students. The bottom line is that test review doesn’t have to be boring or something to cringe at! Have a great testing season! 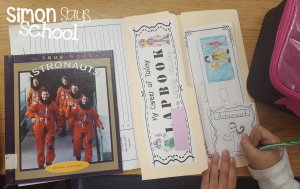 My first graders just finished their Careers of Today Lapbooks, and they look amazing. 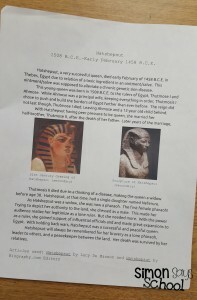 Not only were the final products great, my students were able to apply all of the researching and reading comprehension skills they have been working on over the past 7 months. To begin the project, I placed ten books about different careers in the middle of each table group. I tried to include a variety of modern jobs for students to choose from. I asked students to take a book from the middle and spend two minutes previewing it by looking at the pictures, reading the back cover and first page, and deciding if this was a career they would like to have someday. I then rang a bell and students placed their books back in the middle and chose a new book. We did this ten times. The process took about 25 minutes but the time they spent reading, evaluating, and synthesizing was well worth it. At this point, students had to choose one career that they would like to research. Some students definitely had a hard time narrowing it down, but in the end, everyone chose just one! The next step was doing research. 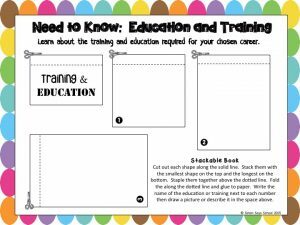 Students were given graphic organizers that broke down the information they had to find into five categories: what do they do?, where do they work?, what tools or equipment do they need?, how do I become one?, and other interesting facts. We had just read a book about park rangers together as a class and completed a similar organizer together on chart paper. I really emphasize to the kids the importance of using bullet points and paraphrasing. As an upper grades teacher, I know how important it is for kids to be able to take notes and not to plagiarize. This is definitely a challenge with first graders but they have gotten so much better the more we have practice. Students used the books they had previewed to complete their organizers. The category, how I become one?, was definitely the most challenging section for students to complete. I asked that kiddos include 3-5 bullet points for each heading and most books didn’t go into great detail into the education and work that went into getting that job. 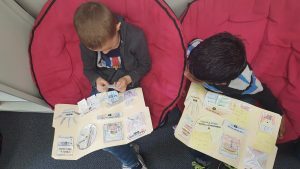 After my kiddos had completed all of their research, we completed the cover of the organizer and each foldable one at a time. Each foldable took about 20 minutes to complete. I precut everything as much as I could beforehand and I also folded all of the lap books before passing them out to students. 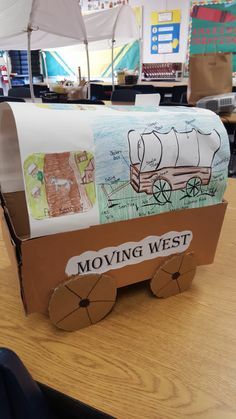 I took the project slow but allowed students who moved quickly the chance to keep going and begin working on the next foldable. 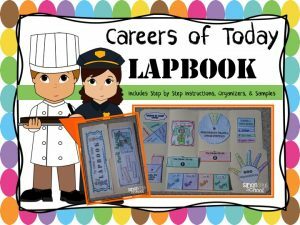 As students finished their lapbooks, I had them pair up and use their lapbook as a tool to teach the other students about the career they researched. I loved hearing them talk so knowledgeably and excitedly about their jobs. Once they were finished presenting, I had them switch partners. 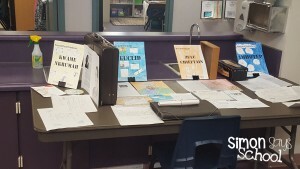 In the end, students presented at least four times and became mini experts of their chosen career! 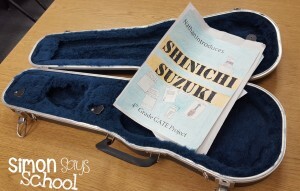 If you are interested in doing this project in your own classroom, you can find this resource here. 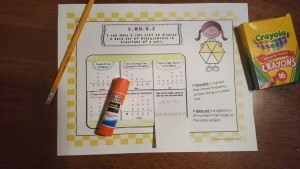 This resource includes all the foldables you will need with step by step instructions. Pictures of student samples are also included. 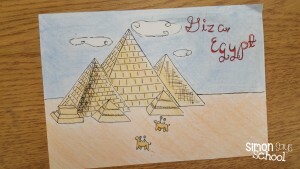 I hope your students have as much fun doing this project as mine did. 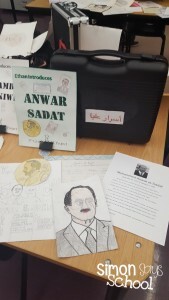 I was so utterly impressed with my students hard work this year creating their Biography Research Projects. 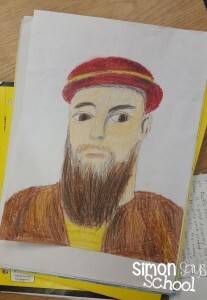 This project is unique because students created authentic artifacts (primary sources) to represent the major life events of a historical figure instead of writing a typical research paper. 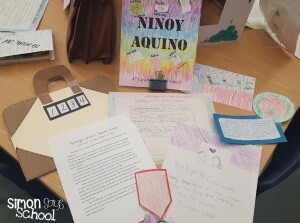 Students made birth certificates, awards, diplomas, portraits, letters, postcards, wedding invitations, photographs, birth announcements, and so much more! 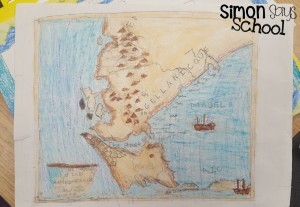 To make each piece, students looked at student samples from the past as well as real examples. 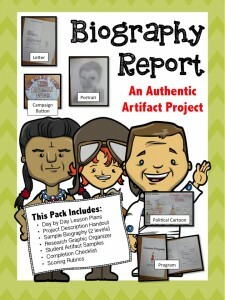 This way they could make their artifact as authentic as possible. 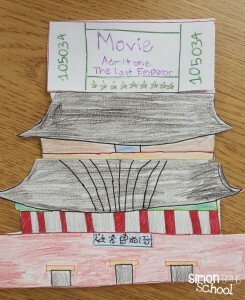 I assigned each grade level a different continent in which to choose their historical figure. My third graders were assigned Europe, fourth grade was given Asia, and my fifth grader had Africa. My only other criteria was that their figure be deceased and had made a positive impact on the world. 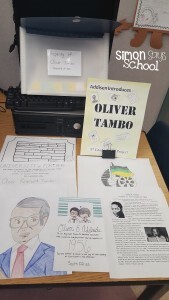 After creating their artifacts, students had to create and store all of their artifacts in a container that represented their historical figure. 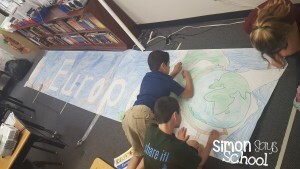 Students displayed their projects at my school’s annual Fine Arts Night and created beautiful and integrate banners for each of the continents represented. 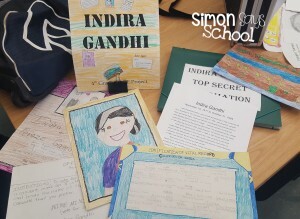 This project is great for strengthening higher order thinking skills and giving children a sense of ownership because they definitely feel a deep connection to their historical figure. 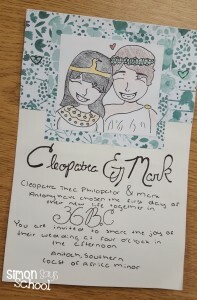 If you are interested in doing this project with your class, you can get it here. 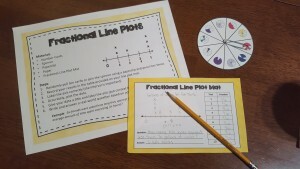 One of the fifth grade standards (5.MD.B.2) asks students create line plots that display measurements in fractions of a unit. I don’t know why, but students have a hard time interpreting information from line plots. However with enough exposure and practice, they can become masters of this often difficult concept. I looked online to find resources to help me teach this concept but found mostly task cards. 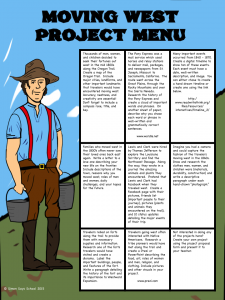 While I love task cards and use them a lot, I really needed a resource that was all encompassing: pre-assessment, notes, practice pages and games, and finally a post assessment. I created this resource myself and hope that others find it as helpful as I have. You can find this resource by clicking here. 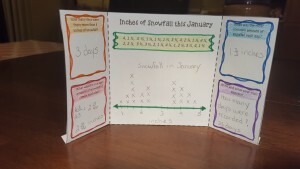 Students then practiced making line plots and creating their own questions using this trifold. 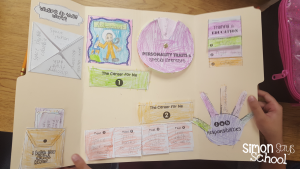 My kiddos loved making the this foldable because it stood up. I couldn’t believe how something so simple could turn an otherwise routine practice opportunity exciting. 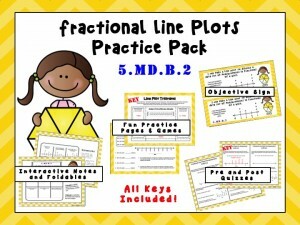 Students also practiced creating their own line plot using the fractional line plot mat. 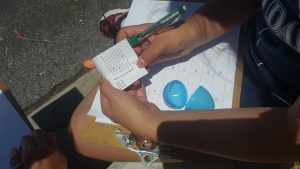 Each kiddo had the choice of using spinners or cards to collect their data. They then recorded their results in a table, created a line plot, then wrote and answered their own question. 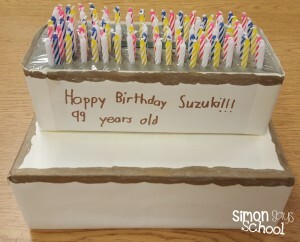 This helped my students to put context and meaning behind the numbers which was extremely powerful! Finally, it was time to give the post assessment. My kiddos did great, and I am so happy that they have mastered what has historically been a challenging concept in the past.